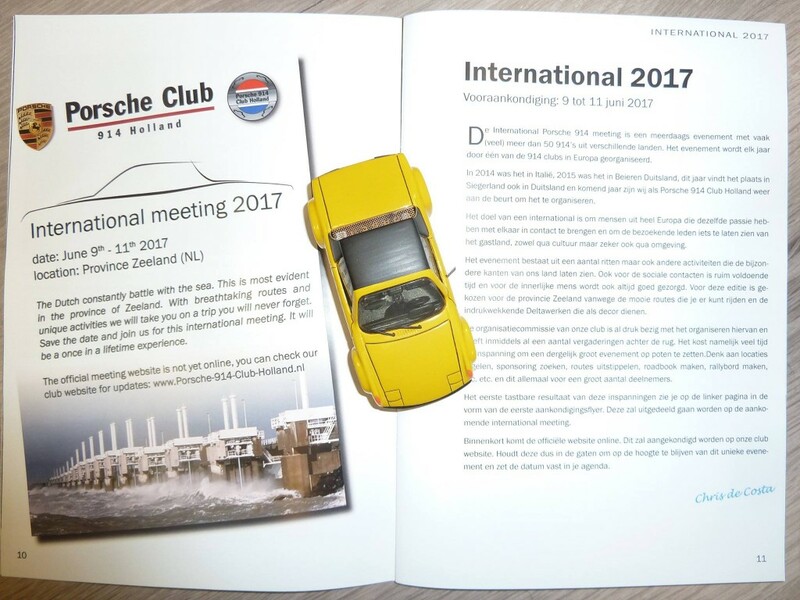 The Porsche 914 Club Holland will be hosting the Porsche 914 International meeting from the 9th to the 11th of June 2017 in the Netherlands. Would you be kind enough to pass on this mail to all your members, so that they have enough time before pre-registration starts. This time we will apply a different registration procedure. Every participant has to be a member of an officially authorized Porsche 914 Club or a Porsche Club. Registration is only possible with a Porsche 914. We want to give all members of all officially authorized Porsche 914 Clubs or Porsche Clubs an equal opportunity to register, so that we could call it a real 914 International meeting. At first we have limited the number of registrations per country to a pre-determined amount. After the 31st of December 2016 the remaining places not filled in by the countries will be filled according to the order of pre-registration. Pre-registration does not give you a guarantee that you can participate. On our club website menu bar the button "International meeting 2017" will appear. Press the button and follow the procedure.